Lysine is used widely in livestock production due to the shortage of feed protein resources. L-lysine·H2SO4 contains L-lysine sulphate as well as fermentation co-products which contain other amino acids and phosphorus. However, there are few articles about L-lysine·H2SO4 product regarding intestinal morphology and liver pathology of broiler chickens. In this article, we focus on the absorption and metabolism of L-lysine·H2SO4 revealed in the variation of intestinal morphology and liver pathology to determine the tolerance of chicks for L-lysine·H2SO4. To evaluate the tolerance of broilers for L-lysine·H2SO4, 240 one day old broilers were allocated randomly to one of five dietary treatments which included corn-soybean diets containing 0, 1%, 4%, 7% or 10% L-lysine·H2SO4 (L-lysine content = 55%). Supplementation of 1% L-lysine·H2SO4 in the diet had no negative effects. However, 4%, 7% or 10% L-lysine·H2SO4 supplementation produced negative responses on broiler performance, carcass characteristics, blood biochemistry, and particularly on intestinal morphology and liver pathology compared with broilers fed the control diet. Our results show that supplementation with 1% L-lysine·H2SO4 had no negative effects on performance, carcass characteristics, blood biochemistry, intestinal morphology and liver pathology in broilers, but supplementation with 4%, 7% or 10% L-lysine·H2SO4 produced a negative response, particularly with respect to intestinal morphology and liver pathology. Lysine is a limiting amino acid that is commonly supplemented in the form of L-lysine·HCl in diets fed to pigs [1, 2], rainbow trout , and broiler chickens . In recent years, an alternative source of lysine in the form of L-lysine·H2SO4 (55% lysine) has been developed with its use being highly attractive for both ecological and economic reasons. This occurs because the production of L-lysine·HCl involves a costly, multiple-stage process requiring the handling of hazardous materials such as ammonia solution (elution of the Ion exchange column) and hydrochloric acid (neutralization of the L-lysine base) which generates residual solutions that are harmful to the environment [5, 6]. L-lysine·H2SO4 is a new source of lysine containing L-lysine·sulphate and fermentation co-products which contain other amino acids and phosphorus. This new source of lysine has been shown to be equally efficacious compared with L-lysine·HCl in diets fed to broilers [6, 7]. Furthermore, the mortality of broiler chickens fed L-lysine·H2SO4 was lower from d 1 to d 42 compared with birds fed L-lysine·HCl, which suggests that L-lysine·H2SO4 can improve the bird’s immune status. Lysine is an indispensable amino acid for non-ruminant animals and has been widely used as a supplement in livestock diets [8, 9]. However, excessive concentrations of dietary lysine can produce negative effects in chickens, such as decreased weight gain, and increased incidence of severe leg problems [10–12]. Furthermore, there are no reports about the effects of high levels of L-lysine·H2SO4 on performance, carcass characteristics, blood biochemistry, intestinal morphology or liver pathology of broiler chickens. Therefore, we designed this experiment to determine the tolerance of broiler chickens to L-lysine·H2SO4 and observe the effect of this product on intestinal morphology and liver pathology when used as a source of lysine in diets. L-lysine·H2SO4 (L-lysine content = 55%) was manufactured by the Changchun Dacheng Industrial Group (Changchun, China). All management and experimental procedures followed the animal care protocol approved by the Animal Care and Use Committee of China Agricultural University (Beijing, China). This study was conducted on Arbor Acres broiler chickens (Beijing, China) for a 35-day period with a completely randomized design. One day old (n = 240) broiler chickens were housed in a standard broiler house with separate feed and drinking facilities. These broilers were weighed individually, wing banded, and allocated randomly to 1 of 5 treatments with 8 replicates per treatment and 6 birds per replicate. The corn-soybean meal diets were formulated as shown in Table 1. The experimental diets were comprised of a control diet with no supplemental lysine and 4 diets supplemented with 1%, 4%, 7% or 10% L-lysine·H2SO4 in two periods (first period: d 1 to 21, second period: d 22 to 35). According to the “European Food Safety Authority” , “Guidelines for the Evaluation of Tolerance of Feed and Feed Additives on Livestock and Poultry Target Animals” (2011) and “Feeding Standard for Poultry” (2004), the multidose group is generally 10 times as the effective dose for evaluating new feed products. As prescribed, the general addition of lysine in feed was 1%. Thus, 1% was selected as the initial concentration, and increased by 3% points in turn, reaching the highest concentration of 10%. Meanwhile, 10% as the highest dose for lysine was also consistent with the standard. The control diet provided 3.04 Mcal/kg according to the nutrient requirements for chickens. The broiler chickens were kept in zinc-plated cages (90 cm × 70 cm × 50 cm) with plastic slatted flooring. The chicks were housed in cages with 24 h constant-lighting and had free access to feed and water. All broilers were vaccinated with live, combined Newcastle disease and infectious bronchitis vaccine on d 7 and d 21 and inactivated infectious bursal disease vaccine on d 14 and d 28. Diets were analyzed for dry matter, crude protein, calcium, total phosphorus and amino acids according to AOAC  procedures. Lysine and threonine were determined by Ion-Exchange Chromatography using an AA Analyzer (Hitachi L-8800, Tokyo, Japan) after acid hydrolysis with 6 mol/L HCl (refluxed for 24 h at 110 °C). Methionine and cystine were determined after oxidation with performic acid and subsequent hydrolysis with 6 mol/L HCl at 120 °C for 16 h and separated by Reversed-Phase HPLC (Agilent 1200, Santa Clara, CA). Tryptophan was measured after LiOH hydrolysis for 22 h at 110 °C using High-Performance Liquid Chromatography (Agilent 1200 Series, Santa Clara, CA). Broilers were weighed on d 1, 21, and 35. Feed consumption on a pen was measured every week. Average daily feed intake (ADFI), average daily gain (ADG), and feed conversion ratio (FCR, ADFI: ADG) were calculated from d 1 to 21, d 22 to 35 and d 1 to 35, respectively. On the d 35 of the trial, one broiler chicken was selected randomly from each cage after an overnight fast. The broilers were slaughtered by exsanguination and eviscerated manually. Carcass weight, semi-eviscerated weight, eviscerated weight, liver weight, abdominal fat weight and pH45 min of the breast and thigh muscle were measured. Dressing percentage, semi-eviscerated percentage, eviscerated percentage, abdominal fat percentage and drip loss were calculated according to the Performance Terms and Measurement for Poultry (NY/T 823–2004, China). Drip loss was calculated by hanging a section (breast and thigh muscle sample) in an inflated and closed plastic bag for 24 h at 4 °C. Samples of the duodenum, jejunum, ileum, and liver were dissected from the slaughtered broilers and immediately fixed in 4% (v/v) paraformaldehyde solution for histological examination. The fixed tissues were processed routinely, embedded in paraffin and cut into 5 μm serial sections, and sections from each tissue sample were selected and stained with hematoxylin–eosin for identification . Five well-oriented villi (determined as the distance between the crypt openings and the end of the villi) and their associated crypt (measured from the crypt villous junction to the base of the crypt) per section were selected and measured under a light microscope (CK-40, Olympus, Tokyo, Japan) at 40 × magnification and analyzed with an Image Analyzer (Lucia Software. Lucia, Za Drahou, Czechoslovakia). The sections of liver were prepared for microscopic examination and representative samples were photographed. Blood was collected in uncoated serum tubes and EDTA-coated tubes at 35 days of age from 8 birds in each treatment by puncturing the brachial vein. Serum was collected and stored at − 20 °C. Serum amino acid concentrations were determined with an Amino Acid Analyzer (S-433D AA Analyzer, Sykam, Germany). Individual serum samples were analyzed for albumin, total protein, globulin, total bilirubin, creatinine and uric acid. The activities of alanine amino transferase, aspartate amino transferase and lactic dehydrogenase were analyzed at the Beijing Sino-UK Institute of Biological Technology Company (Beijing, China). Hematology parameters such as white blood cell count, red blood cell count, hemoglobin, hematocrit, corpuscular volume, corpuscular hemoglobin concentration, red cell distribution width, platelet distribution width, platelet volume and proportion of large platelets were measured by corresponding commercial kits (BioSino Bio-Technology and Science Company, Beijing, China) using an Automatic Biochemical Analyzer (Hitachi 7160, Hitachi High-Technologies Corporation, Tokyo, Japan). Data were analyzed by the GLM procedure of SAS (Statistical Analysis System, Version 9.2) using a randomized design. Means are expressed as the least squares means with pen as the experimental unit. An alpha level of P < 0.05 was the criterion for statistical significance. Polynomial contrasts were performed to determine linear and quadratic relationships of lysine levels. Increasing dietary L-lysine·H2SO4 linearly and quadratically decreased both ADG and ADFI and increased FCR from d 1 to 21, d 22 to 35, and d 1 to 35 (P < 0.05) (Table 2). No significant difference in performance was observed between broiler chicks fed the control and 1% L-lysine·H2SO4 diets during any phase of the experiment (Table 2). When the L-lysine·H2SO4 level in the diet increased to 4%, 7% or 10%, the performance of broilers was negatively affected compared with broiler chicks fed the control and 1% L-lysine·H2SO4 diets during all phases of the experiment (P < 0.05) (Table 2). No significant difference in carcass characteristics was observed between broilers fed the control and 1% L-lysine·H2SO4 diets (Table 3). Increased dietary L-lysine·H2SO4 linearly and quadratically decreased eviscerated percentage and abdominal fat percentage of broilers (P < 0.05), and increased liver index and drip loss (breast and thigh muscle) of broiler chickens (P < 0.05). There were no notably changes in pH value among different levels of L-lysine·H2SO4 treatments. Intestinal morphology was influenced by high levels of dietary L-lysine·H2SO4 (Fig. 1), but no significant differences were observed between broilers fed control and 1% L-lysine·H2SO4 diets. Villous height and crypt depth in broilers fed the 7% and 10% L-lysine·H2SO4 diets were lower than those of the broilers fed 0, 1% and 4% L-lysine·H2SO4 diets (P < 0.05). Villous height, crypt depth and villous height to crypt depth ratio in the duodenum, jejunum, and ileum were not affected when comparing to broilers fed control with those fed 1% L-lysine·H2SO4 diets (P > 0.05). No differences pathology of livers were observed between broilers fed the control and 1% L-lysine·H2SO4 diets (Fig. 2). Hepatocytes were arranged compactly and orderly. There were a few lipid droplets in hepatocytes of broilers fed the 4% L-lysine·H2SO4 diets. When broilers were fed 7% L-lysine·H2SO4, obvious pathological changes were present in those livers. Liver cells were dissociated from each other in hepatic cords, cytoplasmic fat vacuoles. Pushed hepatocyte nuclei to the cell periphery in some places and reduction in size of a few hepatocytes was also seen. There was diffuse infiltration of fat vacuoles indicating vacuolar degeneration in livers of broilers fed the 10% L-lysine·H2SO4 diet. Furthermore, liver cells were dissociated from each other and cytoplasmic fat vacuoles pushed hepatocyte nuclei to the cell periphery in many cells. 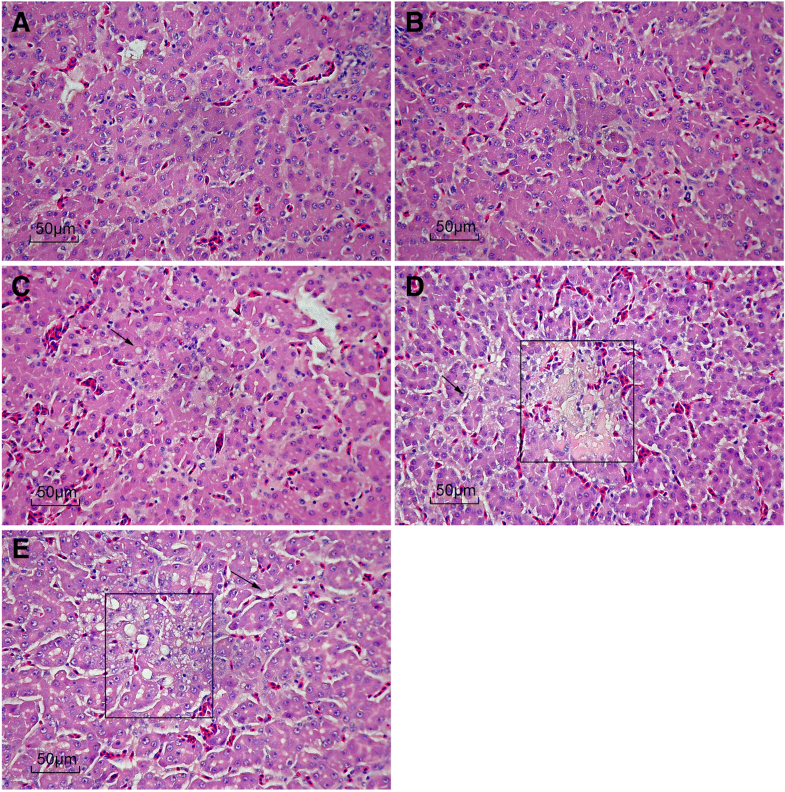 Tissue edema was obvious in livers. No significant differences were observed among broilers fed control, 1%, 4%, 7% and 10% L-lysine·H2SO4 diets for serum concentrations of arginine, histidine, methionine, cysteine, serine and tyrosine (Table 4). Serum lysine and threonine concentrations of broilers were linearly and quadratically increased with increasing dietary L-lysine·H2SO4 level (P < 0.05). Serum glycine concentration of broilers fed 1% L-lysine·H2SO4 diet was higher than that of broilers fed control diets (P < 0.05), while serum proline concentration of the broilers fed 1% L-lysine·H2SO4 diet was higher than that of broilers fed the 4% L-lysine·H2SO4 diet (P < 0.05). Serum isoleucine, leucine and valine concentrations of the broilers fed the 7% L-lysine·H2SO4 diet was higher than that of broilers fed the control diet (P < 0.05). No differences in blood chemistry were observed between broilers fed the control and 1% L-lysine·H2SO4 diets (P > 0.05) (Table 5). Both albumin and total protein of broilers fed the 7% and 10% L-lysine·H2SO4 diets were higher than those of the broilers fed the control diet (P < 0.05), meanwhile increased dietary L-lysine·H2SO4 linearly and quadratically increased albumin and total protein of broiler chickens (P < 0.05). Total bilirubin of the broilers fed the 7% L-lysine·H2SO4 diet was higher than that of broilers fed 0, 1%, 4% and 10% L-lysine·H2SO4 diets (P < 0.05). No significant differences in hematology were observed between broilers fed the control and 1% L-lysine·H2SO4 diets (Table 6). Hemoglobin and corpuscular hemoglobin concentration of the broilers fed the 10% L-lysine·H2SO4 diet were lower than those of the broilers fed the control and 1% L-lysine·H2SO4 diets (P < 0.05). Increasing dietary L-lysine·H2SO4 linearly and quadratically decreased the corpuscular hemoglobin content of broilers (P < 0.05). L-lysine·H2SO4, as a new source of lysine, contains L-lysine·sulphate and fermentation co-products which contain other amino acids and phosphorus . We evaluated effects of L-lysine·H2SO4 on intestinal morphology and liver pathology when used as a source of lysine in broilers diets. We showed that excessive L-lysine·H2SO4 addition in corn-soybean meal diets have negative effects in broilers. The high proportion of L-lysine·H2SO4 (4%, 7% and 10%) in diets had different effects on performance and carcass characteristics when compared to the control and 1% L-lysine·H2SO4 supplementation diets. These results are consistent with previous studies that reported excessive lysine supplementation affected feed intake, weight gain, carcass traits, and feed conversion ratio [16–18]. The content and ratio of dietary amino acids affect the efficiency of amino acid utilization for animal growth [19–21]. For example, 1.95% lysine decreased feed intake and growth rate through reducing arginine efficacy in chicks . In young pigs, three to four times the recommended lysine level (1.15% for young pigs) also decreased feed intake and weight gain through aggravating an arginine deficiency . These results indicated that high levels of L-lysine·H2SO4 that reduced growth performance in broilers may down so by lowering the utilization ratio of other amino acids. In addition, excess L-lysine·H2SO4 caused a high level of dietary sulphate which can influence broiler performance via alterations in acid-base balance. It is generally known that blood plasma proteins and amino acids play key roles in the maintenance of colloid osmotic pressure, by keeping the balance of amino acid through a rapid substitute for indispensable amino acids, assuring steady glucose levels through gluconeogenesis, forming various functional enzymes and enhancing the immune system in the organism [24–26]. Therefore, blood plasma proteins and amino acids have an exceptional significance in maintenance of homeostasis. Changes in serum levels of lysine, threonine, phenylalanine, valine, isoleucine, and leucine in the present experiment were possibly mediated through a change in dietary amino acid levels in the experimental diets. Blood chemistry is a common parameter utilized to estimate avian body condition. Blood albumin serves as the most favorable source of amino acids for synthesis of tissue proteins in the period of quick somatic growth of birds, especially under feed restricted conditions [27, 28]. Experiments on chickens revealed a relatively constant level of albumin in blood over a period from the 2 to 42 days of age . In our study, content of total protein and albumin in serum were higher with supplementation of 4%, 7% or 10% L-lysine·H2SO4 than the control group, which is probably a direct consequence of a high demand for amino acids for somatic growth in birds fed excess L-lysine diets. The chemistry profile and hematological count in blood of animals fed different diets can indicate the chemical and nutritional value of the diets [29, 30]. Addition of lysine in poultry diets improved immunity of birds and resulted in immunological regulatory action [31, 32]. However, the number of white blood cells in blood was higher for broilers fed the diet with 7% L-lysine·H2SO4 compared with broiler chicks fed the 1% L-lysine·H2SO4 diets, which could lead to the resulting in the secretion of much more cytokine and led to inflammatory reactions [33, 34]. Therefore, the growth performance of broilers supplemented with 4%, 7% or 10% L-lysine·H2SO4 was negatively affected compared with broiler chicks fed control diets during all phases of the experiment. In addition, the corpuscular hemoglobin concentration was also markedly decreased when the diet was supplemented with 4%, 7% or 10% L-lysine·H2SO4. This response suggests that there were toxic effects on the hematological system particularly for red blood cells [35, 36]. The folds in the intestine called villi are an important exchange area for digestion and absorption . Villous height and crypt depth are critical factors affecting the animal’s ability to absorb nutrients . In the current study, there was a significant reduction of villous height and a decline of crypt depth in the duodenum, jejunum and ileum in broilers supplemented with 7% or 10% L-lysine·H2SO4. Similar findings were reported for weanling pigs fed a lysine-deficient diet . The reduction in villus height would reduce the surface area available for absorption of nutrients and this may partially explain the reduced growth performance and reduced feed efficiency in pigs fed the excessive L-lysine·H2SO4 diet. The liver is the main size for protein synthesis, and liver histology is important in understanding pathological alterations in response to nutritional sources. Studies have shown that the addition of excessive protein in feed can reduce physiological function of the liver, so the lipoprotein in the liver cells cannot be transported in time, resulting in the accumulation of lipoprotein in the liver and liver lesions [40, 41]. In the present study, we found that high levels of L-lysine·H2SO4 might induce hepatic steatosis in broilers. The total protein content of the serum can reflect the ability of the liver to synthesize protein. The present study showed serum total protein content increased with the addition of L-lysine·H2SO4 in poultry diets, and more than 4% L-lysine·H2SO4 groups were significantly higher than the control group. Hence, excessive L-lysine·H2SO4 could cause a certain degree of damage to the liver cells, which is consistent with the results of liver histology in this study. Our results show that supplementation with 1% L-lysine·H2SO4 had no negative effects on broilers, while supplementation with 4%, 7% or 10% L-lysine·H2SO4 negatively influenced growth performance, intestinal morphology and liver pathology. Our data indicates that doses higher than 1% dietary L-lysine·H2SO4 resulted in a negative response for broilers. We appreciate the technological support from Beijing Advanced Innovation Center for Food Nutrition and Human Health, China Agricultural University, and the Modern Agro-Industry Technology Research System of Beijing. And we thank Dacheng Group (Changchun, China) for providing the crystalline amino acids. The present study was supported by the 111 Project (B16044) of China. All the data were presented in the main manuscript and available to readers. The article was mainly conceived and designed by SQ and XM. Experimental data were collected and analyzed by HJ and WM. The manuscript was mainly written by HJ, assisting revised the draft by TH, JZ and Lee Johnston; and edited by TH, SZ, JZ, HY and SQ. XZ and SQ resourced the project. All the authors contributed to, read and approved the final manuscript. All procedures used in this study were performed according to the guidelines for the ethical treatment of animals by the Institutional Animal Care and Use Committee of China Agricultural University (Beijing, China).